Hello: When editing videos from any source (home videos from sony handcam, DVR recordings and Cell Phone Videos from Samsung and LG phones) The audio track often 75 percent of the time and greater becomes out of time or skewed after the final production. Most of the time I am am working with a single video file from only one of the sources above and I am cutting some unwanted video from the original file, nothing to fancy. I will typicaly make from 6 to 15 cuts in the video. THe video and audio are always part of the same file and I do not try to seperate it, ie I am only using the first track on the time line. If I review my edited movie in the edit section of Powder Director all is well and it plays fine and the audio and video are in sync. Then I go to the produce section and I make either MKV or MP4 with H.264 main codec. The production runs fine but my completed video will have have bad spots, like a glitch and then the audio is not in sync with the video. This will last for the length of the clip until the play back reaches a time where I cut out a section of the original video and then then the video and audio will be back in time with each other. Often there is another visable glitch and then the skew happens again and will reset again at the next edit point. Does anyone know why this happens and a fix? This has been going on for a while and I can't figure it out. I do not get errors to report. Any help would be appreciated. Sorry to hear that you're having trouble. What you're describing is known to happen when previewing your project while it's on the timeline, but shouldn't ever happen in a produced clip. Although you've provided some info on your system (and a lot about your CPU), not much of that is actually helpful in understanding what's happening. Producing issues like you're seeing aren't related to how fast or slow your CPU is, although speed certainly plays a role in how long the producing takes. To help us help you, there is a detailed guide for running the Windows DxDiag test in the Read Me Before Posting section at the top of the PD forum, Following those steps to run the test and attach the results - along with posting the exact version of PD16 you have running - will give us the crucial details of how your system is actually configured. It would also be great if you could share a short sample clip from any of your sources that gave you problems in the produced video. You can upload it/them to a cloud folder and paste the link here. That way other people can see if there might be anything unusual with it/them. It would also help to see what the produced issues look like, and you could upload the video to YouTube and share the link, or add it to the cloud folder. If there's any content you don't want to share, you can try making a quick video of anything, like your kitchen or a TV show. For your issue, it's critical that there is a clear relationship between the audio and video, so keep that in mind. Then see if you can produce a short project that shows the same issues and share that here. Cell phone videos are known to cause the audio sync issue because of the variable frame rates. I have seen tutorials on fixing it but couldn't locate the one from PowerDirector University on fixing it. It's buried under the tons of videos on YouTube. I can't locate the tutorial to post here. It is best that you supply the information requested. There can be different solutions to each audio sync problem. The DxDiag file is attached. Thanks for posting this. Everything in there looks good, you have tons of free space on all of your drives, and your critical drivers are up-to-date. nVidia just released v417.71 a couple of days ago, but you're running the previous version and I wouldn't expect updating to the newer driver to affect your situation. Looks like the key will be to examine the details of your source clips, and especially to see the problematic produced video. It may also help if you could post/attach a screenshot of the timeline in PD16 to give us an idea of how the various clips might be related to the output problems. Hello: As a matter of general practice is using the Hardware Video Encoder in the Fast video rendering technology option on the produce page better than not using it? The video card in my system is pretty new and I bought it pretty much just for this reason. Quote Hello: As a matter of general practice is using the Hardware Video Encoder in the Fast video rendering technology option on the produce page better than not using it? The video card in my system is pretty new and I bought it pretty much just for this reason. The best answer I can give you is that producing with your GTX 1060 will be faster than producing with your CPU, especially to H.265. There are a w i d e variety of opinions concerning "better" though, and in my experience it's possible that some videos may not be as sharply defined when using GPU hardware producing as when you only use the CPU. Again, in my experience, this is highly dependent on the source video content and the specific types of edits you've made. For example, I've had transitions that previewed normally but that looked very blocky or jumbled when produced with the GPU encoder. Many other videos show no such problems - so for me, my go-to solution is to use the hardware encoder unless I see unwanted artifacts in the final video. Since your original issue is that you're seeing some very poor results in your produced output, I would suggest turning of the Fast video rendering technology: checkbox and try producing the same project again using only your CPU. I uploaded one of the final produced videos to a dropbox folder. I did not have room for more than one and in this case I no longer have the original video. If you care to look at it you can see the audio problem within the first ten minutes of the video. I will need an email address from you if you want to access the video. I am working on some other projects, I will make a point to save to original videos and then I find another way to share to them. I could do it through my ASUS router built in AICloud application. I have had problems with Apple mov files. A contributor on the site recommended an App called Handbrake (free to use) to stabilise the frame rate and produce a workable video file. I am familar with Handbrake, I have used it to "Knock Down" large video files that I would want to store on my mobile devices. Is there a setting or profile that is like a "pass through" so you do not loose quality? what do you use? I don't see a way to output to the m2ts format in Handbrake, All of the profiles I have looked at create MP4 ot MKV format files. Can you take some screen shots so I can see? Quote I am working on some other projects, I will make a point to save to original videos and then I find another way to share to them. I could do it through my ASUS router built in AICloud application. Thanks very much for providing me a link to the ASUSCOMM folder. I've downloaded the original 10.5GB .TS video and I cut out the commercials and produced to the identical custom MKV profile you provided, which is shown in the attached composite image. PD17 on my new PC produced the 45 minute, 2.3GB clip in 15:30 using hardware encoding, and it plays perfectly everywhere I viewed a section of the clip, although I have not watched it all the way through. I didn't see any glitches or sections where the audio was out of sync. I've uploaded it to the ASUSCOMM folder so take a look and make sure you don't see any issues. I also opened your project and saw that you had set up chapters, but otherwise it was very similar to mine. For some reason, it took an extra minute to produce your project, but it also shows no sync issues. In the dark blue and orange boxes, you can see we're using completely different Matroska versions. Does anyone on the forum know if these are expected from PD17 and 16, respectively? Also different is the frame settings highlighted in the light blue and red boxes. These may not be significant, but the output profile settings were identical so I don't know if that's another PD16/17 difference or not. My apologies, I was thinking of the freebie to download program (Fab-ease, or similar name?). This programme seems to allow short lengths of mov files to be converted without a copyright marker. I was trying to replicate the problem I was h aging, but seem to have deleted the mov files. It seems that different generations of iPhone have different responses when put directly on PDs timeline. Ie, the picture quality varies. In reguards to the media info above, does anyone know if I have any control over those settings? Such as the writing application and writing library? Does anyone know if the new versions are any better for some reason? Could I set or change the reference frames? Is upadating to PD 17 worth it? I don't do to much fancy stuf but I would like for what I do to work. Thank you to optodata. Quote My apologies, I was thinking of the freebie to download program (Fab-ease, or similar name?). This programme seems to allow short lengths of mov files to be converted without a copyright marker. Quote Hello:In reguards to the media info above, does anyone know if I have any control over those settings? Such as the writing application and writing library? Does anyone know if the new versions are any better for some reason? Could I set or change the reference frames? Is upadating to PD 17 worth it? I don't do to much fancy stuf but I would like for what I do to work. The Matroska (MKV) libs are fixed with respect to PD release, well, unless you start swapping libs but that's a exception. 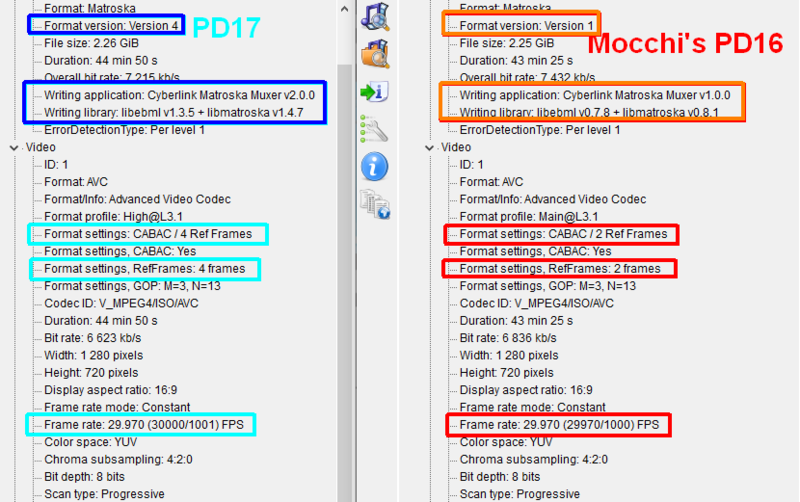 PD17 was the first time the libs have been updated since MKV was introduced in PD11, hence the MediaInfo differences. Your best bet was to convert to a very basic common format with HandBrake as was suggested and edit that with PD, but apparently never tried. The MP4, MKV are just a container, they both can use H.264 codec so no issue. Just be consistent in HandBrake with the end target specs you desire from PD and see if that gets you past the lip sync hurdle. So what is your opinion on upgrading to PD 17?